Many of the postmodern challenges to the modern perspective are questions about the character and nature of knowledge. A particular focus has been on the concept of objectivity. When we view something objectively, we think of ourselves as standing outside the thing being observed. We are able to “walk around” it and examine it from all sides. We remove our prejudice and assumptions and simply observe. The result of this process is what we generally think of as “facts.” This exercise is a function of reason and mutually-agreed standards of acceptable objectivity. The postmodern critique is of the very concept of objectivity. “Where do you stand to be outside of something?” goes the question. In its most extreme forms, no objectivity, no facts are possible. Everything we know is merely prejudice and point-of-view. One result of this model is the current point-of-view news reporting that the culture finds polarizing in the extreme. Orthodoxy does not embrace such a radical stance – but it would agree that it offers valuable insights. The radical claims of the postmodern critique (such as those of the “Antifoundationalists“), are, it would seem, correct. There is no absolute objectivity. Modern Christianity has often adopted the model of “reasonable and mutually-agreed” forms of inquiry. Some of these efforts were monumental. The philosopher Emmanuel Kant’s Religion within the Limits of Reason Alone is perhaps one of the watershed moments in modern religion. Despite such works of genius, the story of modern Christianity is one of continual fragmentation of the faith with ever-shrinking areas of agreement. Within religion, the modern project has failed. It is this failure that lends strength to the postmodern critique of religious knowledge. It is this same failure that amplifies the place of Orthodoxy in the modern world. The Orthodox faith with its grounding in a pre-modern world, has never subjected itself to the constraints of modern rationalism. There has always been a recognition that the life of the Church is a reality, rooted in the very existence of God and His love for humanity, transcending our comprehension. There is nowhere to stand “outside” God in order to subject Him and His actions to rational analysis. We stand within His grace, His life, at all times. “For within Him we live, and move and have our being” (Acts 17:28). Orthodoxy contends that the faith cannot be understood from outside the living reality of the Church itself. This creates problems for the habits of modernity. Our modern habits want to consider claims, make comparisons and judgments, and weigh the options before we conclude anything. We want to subject our world to the habits of mutually agreed rationality. Orthodoxy can, of course, be studied in such a manner, and it’s claims concerning itself hold-up reasonably well. Historically, the Orthodox Church has continuity with itself going back to the earliest point of the Church’s beginning. The Roman Catholic Church (or the Oriental Orthodox) can, more or less, say the same. Orthodoxy continues to preach and teach and liturgize in a manner that is consistent with that continuity. But claims concerning the “fullness of the faith” cannot be examined on the grounds of mutually agreed rationality. Such a reality (fullness) transcends rationality. More than this, the reality that is Orthodoxy, particularly as a “way of life,” does not function under the rubrics of a mutually-agreed rationality. Thus, how Orthodoxy understands God, how it reads the Scriptures, how it regulates its life and communicates the gospel (indeed the very gospel that it preaches) are not items for rational consideration. Here the kinship with postmodern thought is most apparent. The understanding and knowledge of God, the reading of Scripture and such things cannot be seen or known from the outside. There is no adequate description for the nature of this life. The New Testament has a name for this life: the Church. The Church is not an organization or a movement. Despite the institutional aspects of its life that can be described and analyzed – its life remains opaque to those outside it. History has ravaged the institutional aspects associated with the Church. It’s buildings have been sporadically closed, gutted and turned into profane or heterodox structures; its members have been tortured and decimated; its hierarchy has at times been martyred and at times wooed by political leaders who sought to use them. There have been saints, heroes, martyrs, scoundrels, thieves and betrayers – the whole mix of humanity. But the inner life of the Church abides. 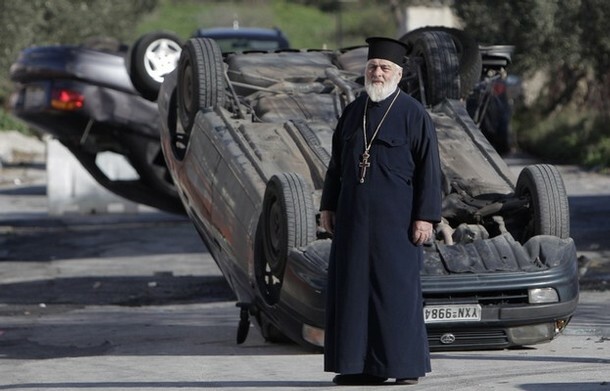 Nothing has happened that so disrupted Orthodoxy that it became something other than itself. Life in the monasteries of Mt. Athos is not unlike the life there a millennium before. Parish life has changed in many places. Modernity is no stranger within Orthodoxy – but its presence is felt. There is no seamless relationship between Orthodoxy and the modern world. It is not inaccurate to say that the greater modernity’s inroads are in the life of an Orthodox believer, the more opaque his own faith remains to him. For some, Orthodoxy simply seems like an alternate ethnic version of institutional Roman Catholicism. However, the Orthodoxy of the sacraments, the relics, the icons, the monks, the music and the saints – in sum, the Orthodoxy of the inner life and experience of the Church remains foreign to the modern world. It is not inaccessible, but it requires a journey in order to reach it. That journey need not be to the Holy Mountain. It is best traveled as an inner journey to the heart. I should say that I have seen some who collect the accoutrements of Orthodoxy like a tourist’s souvenirs. Knowledge about things (regardless of how enculturated they may be in the faith) is not the same thing as the faith itself. And this faith, because it is a way of life, does not yield to rational analysis. There are things that are known because you have been permeated by the liturgical cycle of the Church. The layers upon layers of meaning, reference, cross-reference, image, icon, shadow, text and hymn relate in what seems an infinite series of associations and connections. The result is a gradual flooding of the soul. A person finds that they have a place within that infinite series – gathered in the heart of Christ Himself and His redemptive work. The revelation that accompanies this way of life is not about an object or objects – not about an idea or ideas. Its epiphany is a revelation about the self that has been united beyond the self and become Christ’s Pascha.